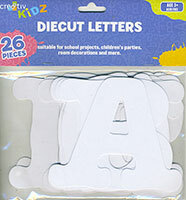 A fun pack of 26 diecut letters, one for every letter of the alphabet. Suitable for school projects, children's parties, room decorations and more. Acid free. Not suitable for children under 3 years.